Basically, this article is going to discuss data migration from Windows Live Mail application to MS Outlook. Windows Live Mail is an email client, which can send or receive email message over the Web browser. Multiple users are unable to synchronize the related information automatically that is saved on this platform. Apart from this, a user becomes unable to use email message which is stored in Windows Live Mail can’t available in MS Outlook repeatedly. Moreover, there are numerous of issues thus, it is necessary to import Windows mail in Outlook. Nowadays, most of the users want to move Windows Live Mail to MS Outlook as it comes with Microsoft Office suites. It helps to manage the data and offers various functionalities as it allows to work in offline mode without internet connectivity. In the following blog, we will discuss the way converting Windows live mail to Outlook. Step 1: First, open Outlook and Windows Live Mail on users Desktop. Step 2: On the screen of Windows Live Mail, click File or Press ALT+M from the File menu bar. Step 3: In the File menu, select Export and click the Messages icon. Step 4: From the Windows Live Mail Wizard, go to Microsoft Exchange and then, click Next tab. 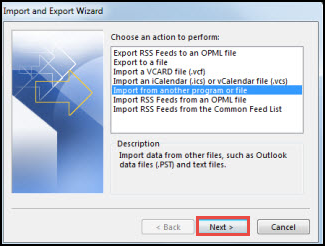 Step 6: To specify the files that a user wants to export, click All and Press OK or even click Selected Folders, that a user wants to Export, and then, press OK button. Step 7: Once the process becomes finish, ‘Export Complete’ message will display. Step 8: Finally, Click the Finish button for terminating the process. After going these steps, a user will get Windows Live Mail emails into their local drive folder, after that, a user will want to convert Windows Live Mail to Outlook. Even a user can go for a third party tool named as Windows Live Mail to Outlook Converter Software. It will beneficial for users to export emails from Windows Live Mail to Outlook accurately and efficiently without any difficulty. Step 1: In Outlook 2016 or 2013, Select File tab. 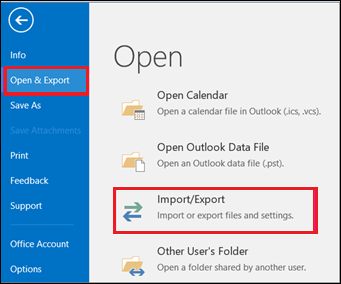 Step 2: Now, to start the Window point to Open & Export and choose Import/Export option. Step 3: After that, select Import from another program or file option and then, Press Next icon. Step 4: Now, select Outlook Data file(.pst) for exporting Windows Live Mail(eml) to Outlook(pst) and press Next tab. 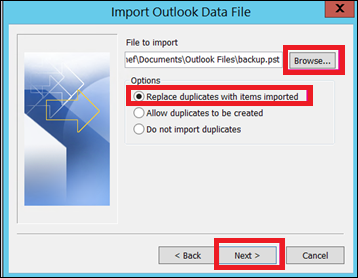 Step 5: Browse the location of Outlook PST file that a user wants to import. Among such Options, select the applicable option under three how a user want to deal with email messages and contacts. Choose Next option. Step 6: In any case, if a password was allotted to Outlook data File (.pst), then, a user need to enter the password and Click Okay option. Step 7: If a user wants to import the contents of .pst file into MS Outlook 2016 mailbox. Then, select the desired mailbox from here. 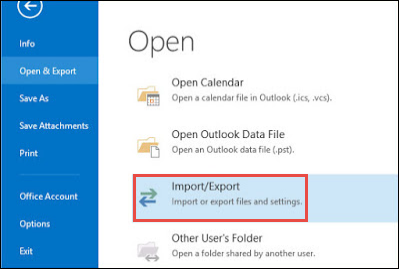 Note: If a user unable to import Outlook 2016 mailbox, then, select Import items from the current folder. This will help to import the selected items into the particular file folder. 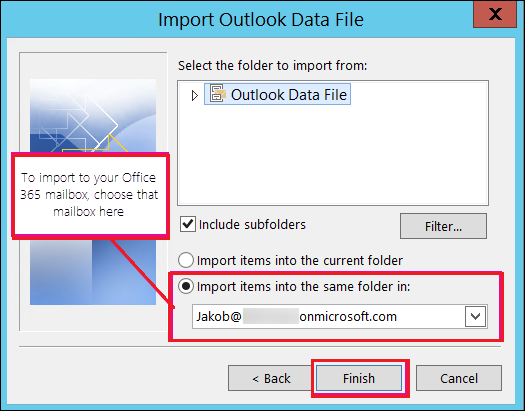 Note: If a user wants to import .pst file to Outlook 2016 mailbox, then, the message will display that it is trying to connect with MS Outlook 2016. This issue occurs when the Web connection will get interrupted, just for a moment. Once, a user internet connection has re-established, proceed to import the .pst file in Outlook. TIP: In any situation, if a user need to retrieve few emails or contacts from an Outlook data items(.pst), a user allow to open the Outlook file and after this, under the navigation Window, drag the selected files and then, drop the emails and contacts from .pst file to existing Outlook folders. How to Transfer Windows Live Mail to Outlook? How to Import Windows Live Mail to Outlook? How to Export Windows Live Mail to Outlook? How to Convert Windows Live Mail to Outlook? How to Migrate from Windows Live Mail to Outlook? In this section, we have described to import Windows Live mail to Outlook a simple procedure to let the users understand transfer Windows Live Mail to Outlook suite. By using two steps to migrate Windows Live Mail emails to Microsoft Outlook (2016, 2013, 2010, 2007, 2003, etc) an easy task to load the files quickly without any difficulty. In addition, also deals such reliable solution to convert Windows Live Mail to Microsoft Outlook.